Learning How to Create Comics With a Rabbit Samurai – Stan Sakai’s Usagi Yojimbo: Samurai and Other Stories – LILY & GENEROSO 4EVER! Given my natural affinity to Westerns, I am amazed that I have yet to dive to far into the samurai genre, the foundation for most of the tropes and themes in the Westerns I adore. With the variety of samurai adaptations seen over the years, I always wonder what each incarnation has to offer. Melville’s Le Samouraï placed the concept of the bushido code in 1960s France. In contrast, Kobayashi’s and Takeshi Miike’s versions of Harakiri remained true to the Edo period. Consequently, when I found the gallery edition of Usagi Yojimbo, I was curious to see the effect of anthropomorphism on the story of the traveling ronin. A series spanning over nearly three decades, Usagi Yojimbo follows Miyamoto Usagi, a former samurai whose lord died in battle. As a ronin (i.e. lordless samurai), Miyamoto wanders across Japan during the shifting Edo period, offering aid to towns in need and offering services as a yojimbo, a bodyguard. Unlike the images of samurai we know, Miyamoto is a rabbit, and his world involves other animals in the place of humans. Certainly entertaining, Usagi Yojimbo has a far different tone than the standard samurai tale. Rather than using minimal and distant storytelling, Stan Sakai, the creator of the series, focuses on making Usagi Yojimbo more didactic. By using animals in the place of humans, Sakai invites younger audiences to read the stories, and by including explanations of core samurai concepts, Sakai also teaches readers about the fundamental basics of the samurai genre. The early stories of Miyamoto included in the gallery edition, Usagi Yojimbo: Samurai and Other Stories, explore the bushido code in addition to human motivations, ranging from honor to guilt to greed. In sum, all of the stories focus on Miyamoto’s code of ethics in a changing world where the samurai has begun to face extinction. While less dire than Harakiri, the Japan of Miyamoto Usagi needs the original samurai code of ethics, but the people do not seem to realize it. Usagi Yojimbo teaches readers about the way of a righteous samurai in contrast to the ignoble ones he encounters as the feudal society around him begins to change. Given its educational leanings, Usagi Yojimbo may be a bit frustrating for readers looking for a new perspective on the samurai. However, for what Usagi Yojimbo lacks in complexity, it makes up in charm. With the gallery edition, Sakai earnestly draws himself introducing the collection, and he even conveys how he creates each page of Usagi Yojimbo. Furthermore, the gallery edition includes re-prints of the original, unedited, Bristol artboards used for the collected stories, which span the first ten years of Miyamoto Usagi. Thus, as a collection, the gallery edition of Usagi Yojimbo not only teaches the audience about standard samurai motifs but also how to create a professional comic. In addition to explaining techniques at the beginning, the stories include imperfect pages with an occasional whiteout spot here or there, serving to remind and encourage any new or seasoned comic book artist or letterer to keep on practicing and creating. Admittedly, if it were not for the gallery presentation of Usagi Yojimbo, I am not sure if I would have enjoyed the book as much. Miyamoto Usagi, the samurai rabbit, is an appealing character, but beyond his manifestation as an animal, he differs little from other ronins we’ve seen in samurai films and the various versions of ronin adapted over the years ranging from the man without a name to the rogue yukuza. Despite this, Sakai’s humble and welcoming introduction along with the large format pages make the book something special. You can study each line, each letter, each character and combine all of them to admire Sakai’s vibrant, kinetic visual style. Usagi Yojimbo: Samurai and Other Stories serves best as a comic book creator’s resource or as a gateway into the samurai genre for a new reader, but regardless of your understanding of samurai or comicbooks, you’ll still have fun seeing rabbits with top knots fight rhinos, moles, and cats and get excited to see the adorable tokage (lizards) that look like a cuddly cross between a brontosaurus and Al Capp’s Schmoo; I know I certainly did. 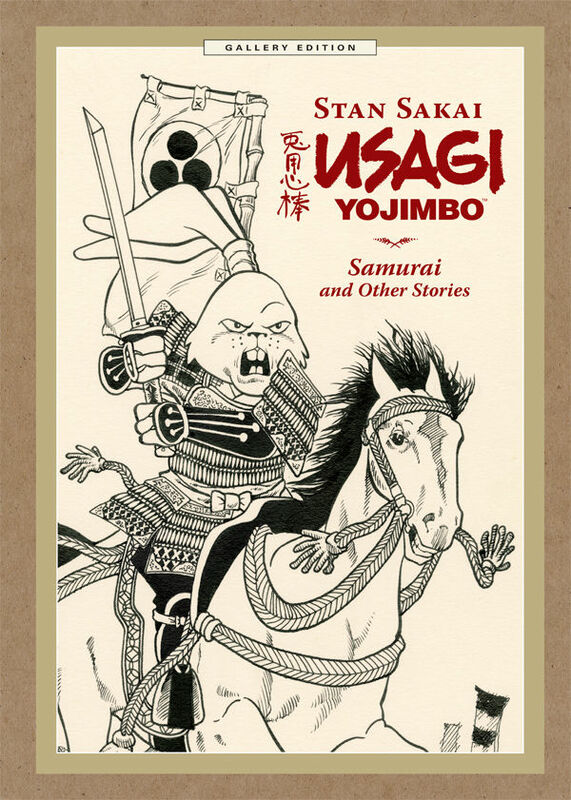 Usagi Yojimbo: Samurai and Other Stories by Stan Sakai is available via Dark Horse.